Tirumala Tirupati Devasthanams TTD is publishing Sapthagiri Magazine every month in Six Languages Sanskrit(new publication from April-2014 onwards), Telugu, Tamil, Kannada, Hindi and English. It was started as a TTD Bulletin in 1949. Pilgrims or interested devotees can subscribe for this sapthagiri monthly magazine for a minimum of one year subscription or for Life Subscription. TTD has decided to publish "Sapthagiri Magazine" in "Sanskrit" language also from APRIL2014 onwards. As a part of it, TTD has relased 1st independent "SANSKRIT Sapthagiri" Magazine for the month APRIL2014 consists of 16pages. This is an illustrated Sanskrit Sapthagiri Magazine to the Sanskrit Readers. Step 3: Send filled in Subscription Form along with DD/MO to the address mentioned here. The Saptagiri Magazine contain articles on Hindu Philosophy, Dharmas and Culture. It also contains Special articles on Vedas, Hindu Festivals,Hindu Temples and Sandehalu and Samadhanalu on Hindu Dharmas (Questions and Answers). 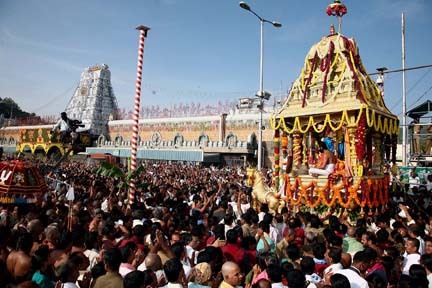 It is also specially designed featuring about TTD Tirumala Information, Tirumala Srivari Annual Sevas and other facilities offered to Pilgrims.